I suggest doubling the recipe on this one. Trust me, you’ll want leftovers. Start by making your hot ham water. 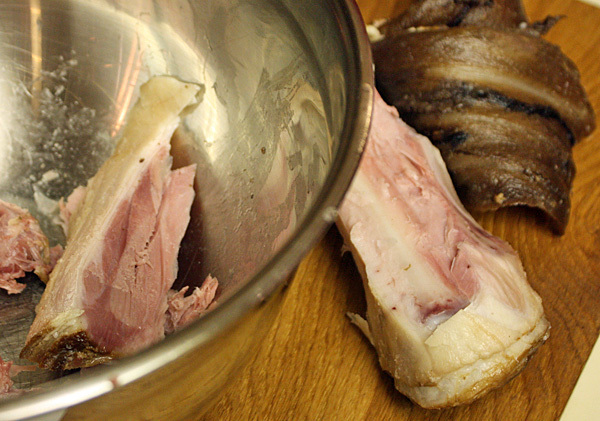 Fill a medium pot with enough water to cover your ham hock. Bring the water to a boil, then reduce heat to low and simmer for 1 hour. When the hour is up, remove the hock, let it cool, remove the skin and shred the meat. 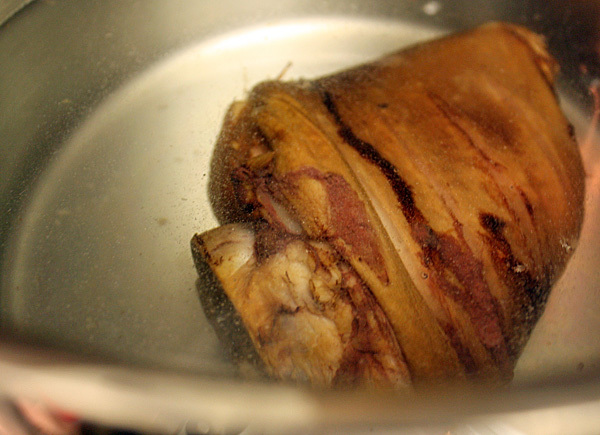 Keep the pot on the heat and reduce the ham stock down to 1 1/2-2 cups. This will intensify the porkiness and leave you with just enough stock to cook down the kale in. 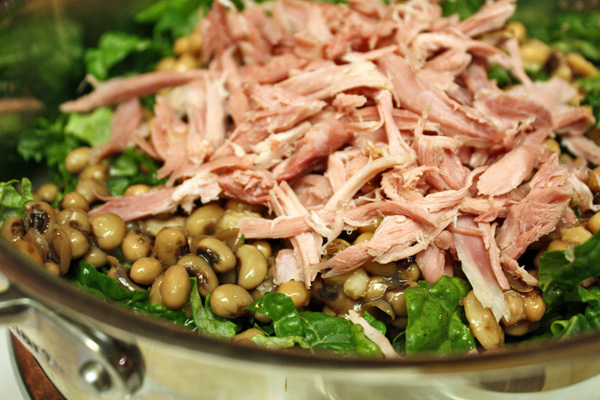 When the pork stock is reduced, add 1 bunch of kale, 1 can of black eyed peas and the shredded ham. Cover and cook over low for 15-20 minutes. When done, season with salt and pepper to taste and reserve. To get the chicken and corn done, first preheat your grill to high. Next, create your dry rub by combining 1 t of salt, 1/2 t of onion powder, 1/2 t of garlic powder, 1/2 t of paprika, 1/2 t of black pepper and a pinch of cayenne pepper, enough so you can taste the heat but it doesn’t overwhelm the rest of the spices. Give 2 6 oz. 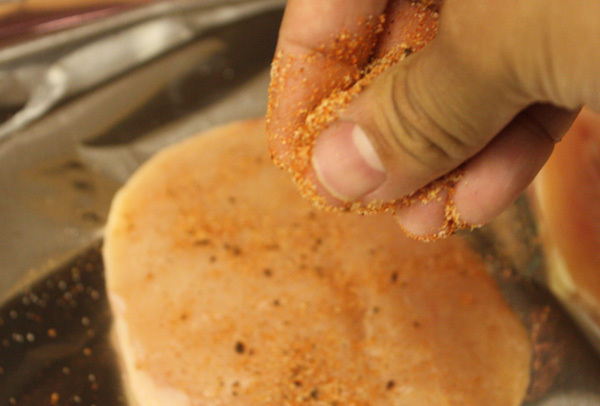 chicken breasts a generous coating of the spice mix and toss the chicken on the grill along with 1 ear of corn. Grill the chicken until cooked through, 3-4 minutes per side, and cook the corn long enough that it has a little char on it. While the chicken rests, make the salsa. 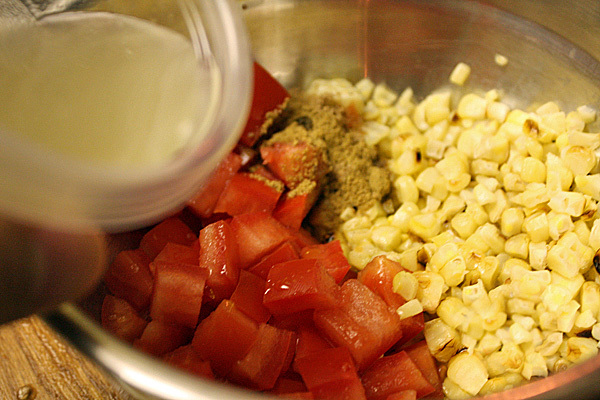 Cut the corn from the cob and combine with the diced roma tomatoes, juice of 1 lemon, 1/4 t of coriander, 1/4 t of cumin and 1/2 T of olive oil. Season with salt and pepper to taste. To plate: Put a generous amount of the kale mixture in a shallow bowl and ladle in some broth from the bottom of the pan. 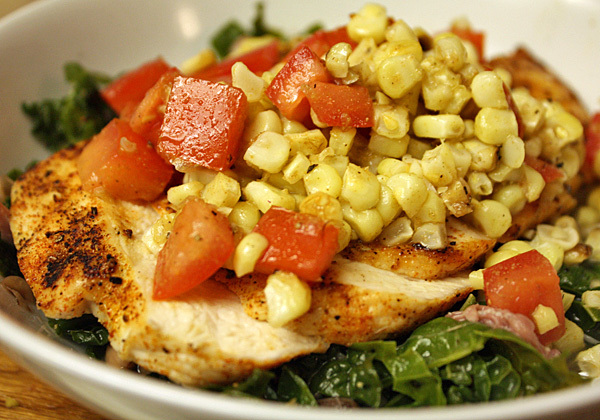 Top with sliced chicken breast and finish with as much corn and tomato salsa as you’d like. The flavors on this one are through the roof. 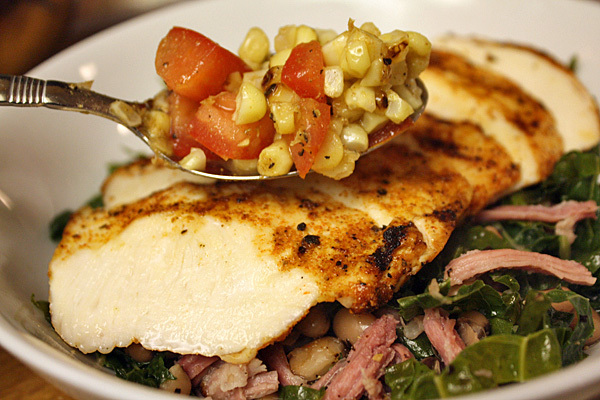 The chicken rub, potent on its own, shines amongst the sweet salsa and salty kale. The black eyed peas impart an earthy taste that lingers in the background of the dish, while each bit is finished with the slight pucker of lemon juice. Lots going on here, but lots to love. That’s for sure.